Easy Decision All of these advantages plus more than 50% cost savings over the competition make Jazz/e easy to justify. You'll be really jazzed about Decision Data's new IP/SNA solution! Easy Installation all the Jazz/e hardware and software is conveniently included in one shipping carton. You don't need any special tools or a PC to complete the installation process. Easy Configuration Jazz/e is the easiest controller on the market to install, configure and use. Unlike competitive solutions, Jazz/e doesn't require a PC or multiple diskette exchanges for installation. Answer a few simple questions from any locally connected terminal and you're done. And configuration information is available any time, even while on-line! Easy IP Connectivity Jazz/e supports IP (Native IP/AnyNet to AS/400) as well as traditional SNA connections. Easy Compatibility 5294, 5394, 5494 or AnyNet/IP. Jazz/e connects 16 to 56 remote devices to an AS/400 using traditional SNA connections or MPTN/AnyNet across an Ethernet topology, giving you exceptional performance and productivity. Easy Expandability Jazz/e controllers are fully extendable. Expand from 16 to 56 devices...add TN5250 server support...add LPR/LPD print support. Easy Upgrades Jazz/e software is also available for existing Concert controllers, a cost-effective upgrade to IP/AnyNet capability. Jazz/e software is substantially pre-configured at the factory. 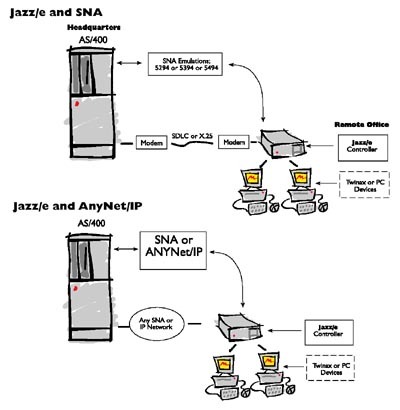 Just select SNA or IP as your protocol of choice, and Jazz/e does the rest! In the 5494 mode, the Jazz/e will even auto-configure at the AS/400 further simplifying the installation and configuration process. Jazz/e automatically detects the type of devices that are attached via twinax cabling or UTP, then builds the appropriate support (displays, printers and PCs with twinax emulation cards). To configure Jazz/e, simply enter the name of the appropriate S/3X or AS/400 and your controller IP address from an attached dumb workstation. You'll never need a PC! Diskettes for 5294, 5394, 5494 and AnyNet/IP functionality are included with your Jazz/e software in the shipping carton. To connect, just select SNA or IP as the protocol of choice. If you select IP, the Jazz/e controller knows that you want to use AnyNet, so the only information you need is the IP variables, such as the AnyNet addressing scheme of the target AS/400 and the assigned IP address of the Jazz/e controller. Jazz/e delivers AnyNet/IP compatibility to almost any midrange environment. Jazz/e gives you a choice of 16, 28 or 56 device support, so you can choose the most cost-effective configuration to meet the needs of any remote location. Jazz/e software is also available for existing Concert controllers, a cost-effective upgrade to IP/AnyNet capability. With a choice of 16, 28 or 56 device support, Jazz/e makes it easy to choose the most cost-effective configuration to meet the needs of any remote location. An easy upgrade path to more devices or more capability ensures maximum investment protection.